Every year, [ilektronx] and a few other guys get together and compete in a ‘no holds barred’ pinewood derby for kids of all ages. Of course this results in an immense amount of engineering to push a wooden block with wheels down a track, and [ilektronx]’s car is no exception. He won the competition with electronics from a remote control airplane bolted on to a piece of wood. The electronics for [ilektronix]’s build are pretty much what you’d find in any small electric RC plane: a cheap transmitter / receiver combo sends commands to an ESC which powers a small brushless motor with a small LiPo battery. 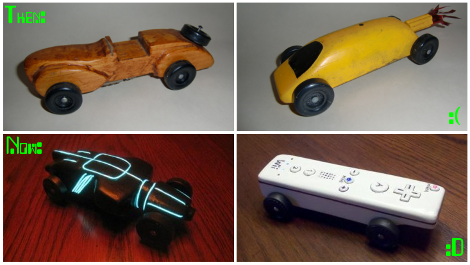 Like all good pinewood derby cars, the success of [ilektronix]’s entry relied on the overall design. The wooden chassis cleverly hugs the raised guide in the track, and the slight downward angle of the propeller keeps the car from popping a wheelie when it is released from the starting line. You can check out a video summary of the pinewood derby competition after the break. Also shown are a few of the other derby cars, including an amazing futuristic tank entry built by [Ken Cook]. [Ken] spent the better part of a year on his build, and the amazing detail of making his own tank treads by hand made him a shoe-in for the winner of the ‘style’ competition. When it comes time to unwind at the Dyson design facility these engineers know how to do it right. 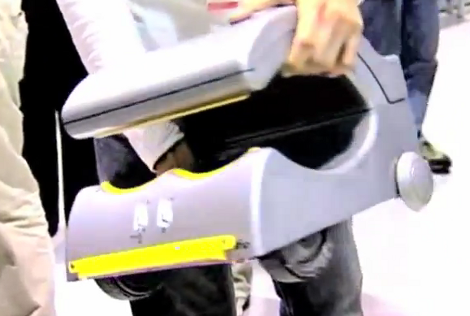 Recently, the company challenged their engineers to a grown-up version of the Pinewood Derby in which they raced their own cars powered by a Dyson motor. The video after the breaks shows a large collection of these time trials on a track made from upturned wooden pallets. Most of the vehicles are made from parts which we don’t recognize. But some of them are very familiar like our favorite hand dryer ever (seen above) and the iconic goldenrod manifold from the Dyson ball vacuum cleaner. The course ends abruptly, as you can see in the last run of the video. There is one entry that included a human rider and he seems to be going nearly as fast as the riderless carriages are. The video cuts away before he hits the wall, but we can’t image he had the time to include brakes in that design. Need some gears? Got a timing belt? 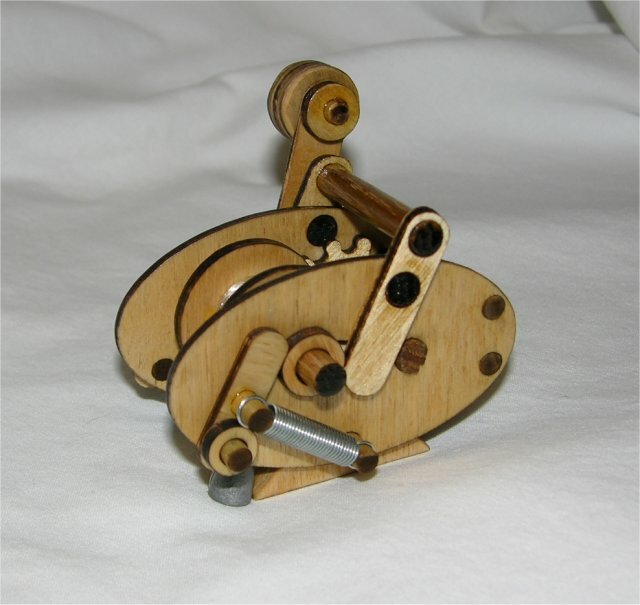 [filespace] sent in a neat build he stumbled upon: making gears with plywood and a timing belt. Just cut out a plywood disk and glue on a section of timing belt. There’s some math involved in getting all the teeth evenly placed around the perimeter, but nothing too bad. Also useful for wheels, we think. We’re on a chess kick now. Huge chess sets are cool, right up until you try to figure out where to store the pieces when they’re not being used. [Jayefuu] came up with a neat solution to this problem. His pieces are cut out of coroplast (that corrugated plastic stuff political campaign signs are made of), making it relatively inexpensive and just as fun as normal giant chess pieces on a tile floor. [Randy]’s son is in the cub scouts. Being the awesome father he is, [Randy] helped out with this year’s pinewood derby build. It’s a car shaped like a portal gun with the obligatory color-changing LED. The car won the ‘Can’t get more awesome’ award, but wheel misalignment kicked it out of the competition during qualifying rounds. Sad, that. Still awesome, though. Caltech professor [Yaser Abu-Mostafa] is teaching a Machine Learning class this semester. You can take this class as well, even if the second lecture started last Thursday. [AlanFromJapan] sent in this product page for an Arduino-powered speech synthesizer. We’re probably looking at a relabeled ATmega328 with custom firmware here; to use it, you replace the micro in your Arduino Uno with this chip. The chip goes for about $10 USD here, so we’ll give it a week until someone has this proprietary firmware up on the Internet. There are English morphemes that aren’t in Japanese, so you can’t just ‘type in English’ and have it work. Here’s a video. Six things in this links post. We’re feeling generous. What would you build if you had a laser cutter? [Doug Miller] made a real, working fishing reel. No build log or files, but here’s a nice picture.